Have you ever run in space? If not, then pack your bag and jump into Run 1. What’s fun in this cool flash running game? 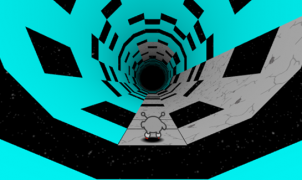 Here, you will help an alien run and jump across an endless tunnel without falling off the abyss. Before the game starts, you need to choose between two modes – Adventure and Infinite. The important thing here is not the mode you select, but the objective you have to accomplish. Take role of the alien and run through the 4-dimension platforms. Beware of all the holes and gaps on your way. You can jump or rotate the platform to dodge over obstacles. Try to complete all levels in two modes for an ultimate win. If you fail, don’t need to worry as you can replay until succeed. Go ahead, focus your attention, and start running! What I like most in Run 1 is – you can edit your very own mode and play in there. Play this cool math running game with the arrow keys and spacebar. Joseph Cloutier is the one created Run 1 and other two games in the series. Run is a web browser game and also available as an Android app. Run 1 was first released in March, 2011. If you want more challenges, then you should go play Run 3, the last and also the best.